Companies come and go all the time. Why do some companies survive generational changes? Why do some survive technology changes? Yet, so many companies don’t seem to be able to adapt to changing times and miss opportunities that seem obvious in retrospect? IBM, Zerox, and others are examples of companies that owned an industry only to miss a wave of technology. Smaller more nimble companies took advantage of the technology change and overtook them in their own industries. While each company is still around today, they missed billions in revenue and profits by being late to the change. Construction is not immune to the impact of technology. Neither is your business. You mist consider the changes in technology with fresh perspective and be willing to adapt in order to survive. If your business is a small business than you are in the best position to take advantage of construction technology changes to out compete your bigger competitors. Construction apps are flooding the market. Are you taking the time to sort through them and decide what could help you be more efficient? Are you using the changes in construction technology to your advantage or are your competitors beating you to it because you are “too busy”? 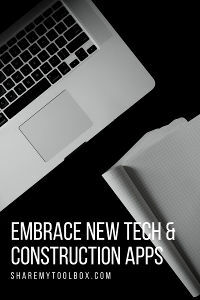 Read on to learn more about the changes in construction technology and how this situation has occurred over and over again in other industries. Either harness technology changes for your company’s benefit or be at a disadvantage to those that do.